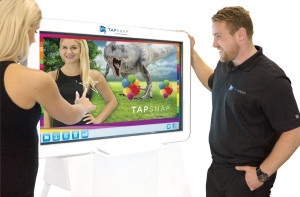 TapSnap’s portable photo entertainment system is sleek and sophisticated, and was designed with you as the franchisee in mind. In fact, running a TapSnap is a hair shy of being a one-person job. Completely mobile, TapSnap takes less than 15 minutes to set up and take down. Unlike traditional photo booths, which are hard to move and make short events impossible, the kiosk can fit in any SUV. Many TapSnap owners operate the business as a family-run franchise or easily train someone else to operate the kiosk for them. This simplicity assures that no event is off limits. TapSnap’s open-air photo booth is available for outdoor and indoor fairs, festivals, corporate events, weddings, and birthdays. It offers a variety of personalized digital props and backgrounds and corporate branding, ensuring your event is a one-of-a-kind experience. In addition to the simplicity of the operation, the franchise runs with low overhead and offers opportunities for high profit margins. After a three-day TapSnap University hands-on program, featuring a world-class sales curriculum with Brian Tracy training, franchisees learn everything they need to know about running a TapSnap business. Many franchisees receive their TapSnap system within days of returning home from training and are up and running in no time. TapSnap provides you with ongoing support and a coordinator, who is an expert in your market of operation. And, you will have access to a national public relations firm and ongoing advertising and marketing for your business.